Early on the morning of October 12, the 15 new STS students departed for a 3-day excursion to the Galilee region of Israel. Accompanying them were Fr Stanislaus Swamikannu, professor of Salesian Studies and Rector of the Salesian Community of Ratisbonne, Br Hilario Seo, member of the Salesian Community of Ratisbonne, and Fr Roman Mazur, Professor in Sacred Scripture and guide for the excursion. 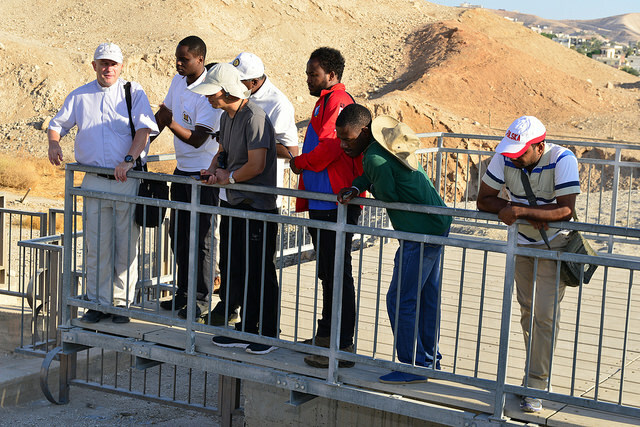 The group began by visiting the city of Jericho, specifically the Tell es-Sultan archaeological site. There students could hear explanations of the archaeological work as well as biblical events which took place on Mt Nebo and the Mt of Temptations. After a short stop at a sycamore tree and spiritual reflection by Fr Roman on Zacchaeus, the group visited the river Jordan and renewed their baptismal promises. The drive and visit were filled with biblical, political, and historical insights into the locale. The morning finished with Mass at the main chapel in Magdala and lunch in Kibbutz ein-Gev where “Peter’s fish” was served. After lunch, the participants took a boat ride on the Sea of Galilee. It was a beautiful experience to hear the Gospel of the storm at sea on that very sea of the event. A ride in to shore and a short visit to Kurzi later and the participants departed for their housing for the night. The Salesian community of Nazareth living on the campus of the Salesian Technical School and Church of Jesus the Adolescent offered hospitality for the three days and two nights. After dinner, the Rector of the Salesian community invited the participants for a private tour and presentation on the history of Salesian presence in Nazareth as well as the contemporary mission of the school. The theme for the second day could have easily been “In Jesus’ Footsteps”. Each site had a clear Gospel passage with which it was connected. The day began at the Wedding Church at Cana with a church tour and archaeological lesson by Fr Roman. Afterwards came a visit to the Hermon Stream in Caesarea Philippi. Fr Roman wonderfully explained that the “On this Rock” statement’s the topographical and geographical context deepened its meaning. 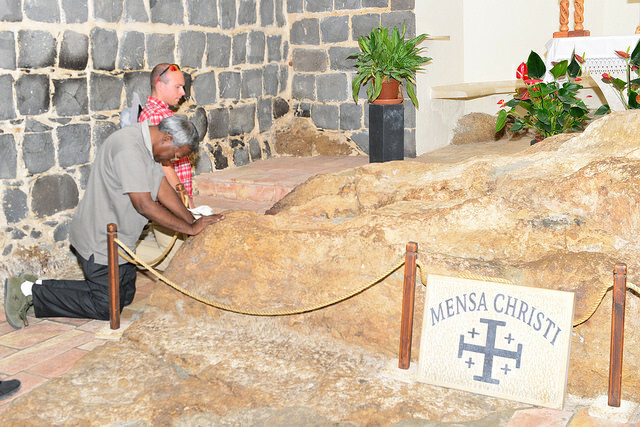 It was by the rocks of the Temple Pan that Peter confessed Jesus to be the Son of God. 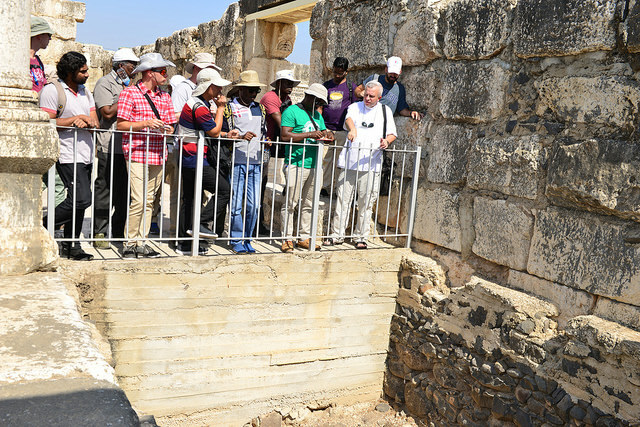 Continuing on the theme of Peter, the group ventured to Capernaum to see the house of Peter’s mother-in-law, the active archaeological site and the Temple. A short trip down the road to Tabgha was next with visits to the Church of the Primacy of Peter and the Heptagon Church of the Multiplication. The day concluded with Mass on the Mt of Beatitudes, dinner with the Salesian community of Nazareth, and a moment of encounter with some young people of Nazareth at the school. The third day of the trip saw some of the most spiritually as well as academically enriching moments of the trip. The group began its day at Zippori National park to learn about the history of that locale and to have some specific insights on mosaic study. A return to Nazareth was next with a walk to the Well of Mary followed by the Synagogue Church. 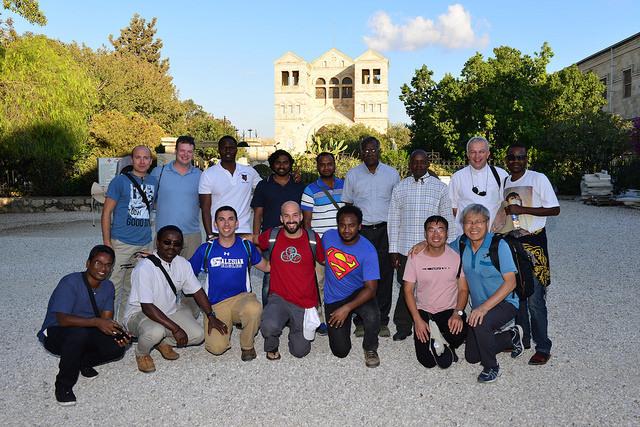 The group received an unexpected opportunity when the custodian of the Church invited the group to see the interior of the Greek Catholic Church of the Annunciation and reverence both the book of the Gospels and tabernacle. Time was short, and the group had to depart for visits to the Basilica of the Annunciation and the Church of St Joseph. 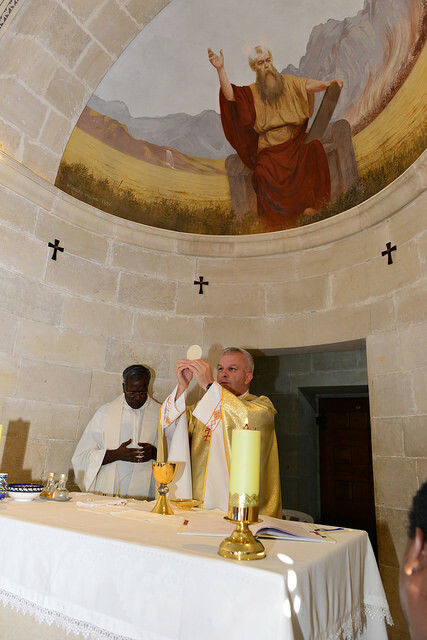 After a final lunch with the Salesian community in Nazareth, the group visited Mt Tabor and celebrated Mass in the Chapel of Moses within the Church of the Transfiguration. The 3-day experience was not only academically enriching, but spiritually and holistically fulfilling because of both the grace of the places and the leadership and insights shared by Fr Roman.